I love monster books. To me they are clearly the greatest thing about RPGs. Most of the books I have are monster books, many even for games I don’t play. But when I flip through them, I often just look at the illustration and read the first few lines of text before I get bored with a creature that seems completely uninspired and overdone, and continue to the next one. But occasionally, there are creatures that are actually quite interesting and unique if you really give them a chance. And sometimes their greatness is immediately visible from the first second. With the Fantasy Safari series, I want to return to many of the old monster books that I’ve pretty much forgotten about, and maybe occasionally pick up some new ones, to go hunting for rare and exotic creatures that you rarely get to see. 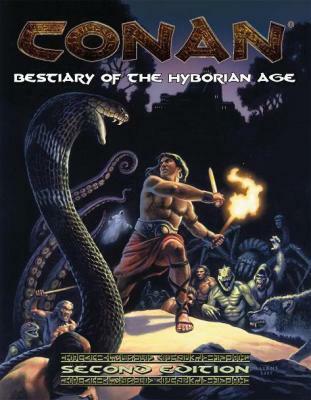 Bestiary of the Hyborian Age for Conan d20 by Mongoose Publishing, 2008; 122 pages of monsters. The Black Fiend is the first creature in the book which actually is somewhat interesting. A black fiend is a roughly human-shaped demon that can pass for a human at a distance and in the dark, but has horns, claws, fangs, and pointed ears, that clearly mark it as a monster. They prefer to stay in darkness and often wear dark cloaks and hoods to hide their demonic nature from casual observers. They are not particularly powerful, but very stealthy, which makes them good assassins, and also have a great talent for sorcery, and many are spellcasters who can be summoned to learn rare and exotic spells from them. I think it’s the combination of being both an assassin and spellcasters, that makes the black fiend a bit more than just another demonic looking man. On the first look, the Black Spawn of Jullah are just another type of large demon that look like large black apes with fur that seems to be permanently soaked in blood. As servants of the ape god, they can produce a roar that will summon large numbers of actual apes from the surrounding jungles to attack their enemies. An even weirder trait is their ability to use their own bodies as a kind of portal to hell, allowing tentacles and tendrils of some hellish abominations to burst through their bloody fur and grasp and bash at their enemies. The black spawn looks like a generic evil ape, but I think figting one of these will actually get quite frightening to players when they suddenly find themselves swarmed by large apes from all directions and the tentacles burst from the beasts bodie. I think I want to use these ones in my campaign. A Bodiless Slimer is a demon made of almost insubstential slime that is also entirely invisible. They are very hard to detect and to injure and can also use a breath of flames in addition to their normal attack of grappling and choking their victims. Before a fight, they use a kind of subconscious telepathy to demoralize their enemies. These could make for interesting encouters, but the creature itself is rather bland. The Foaming Blasphemy is a really weird creature. It’s originally a human but got afflicted by a demonic curse that causes its body to constantly mutate and rearrange itself, growing new limbs and organs as others disappear. Worst of all, any creature hit by a foaming blasphemy suffers the same curse and has to have impressive willpower to keep its own form stable. When their willpower fails, the experience of the rapid mutations is so horrifying that it will drive them insane over a short time, and eventually turn them into another foaming blasphemy permanently, unless powerful magic can break the curse in time. The Gelid Abomination is described as a weird cross between an octopus and a frog, but I think that doesn’t really quite explain how alien the illustration actually looks. In addition to their tantacles, which they use to draw their victims into their mouths, they also have the voices of human women or children, which are so unsettling that they make anyone who hears them extremely vulnerable to getting frightened and panicked. Two words: Ghost Whale! A ghost whale is a massively large undead appearing like the skeleton of a whale, but is much more intelligent than either most animals or undead. They often come to the surface at night when the moon is out and ships always make a very large circle around them to avoid attracting their attention. The Guardian Demon has no illustration, which is a shame. It’s a large pile of bodies and body parts from insects, rats, bats, and humans that pretty much rolls along the ground. It’s suprisingly stealthy and often stalks its targets until it gets a good opportunity to strike. When engulfing a target, the mouths and jaws of the guardian demon start to bite at the victim and drain his blood. Any dead body of humans and vermin the guardian demon comes about is simply added to the mass. The Hydragon doesn’t look particularly noteworthy at first glance. It’s a very large bipedal dinosaur with almost humanoid arms and hands and the head of a giant snake. However, the hydragon is no natural creature but the creation of an ancient curse. Anyone who slays a hydragon, but does not do so in single combat, is threatened to become a hydragon himself. Even if the slayer escapes the curse, it lingers on the dead hydragons remains and can potentially affect the next person who touches them. The curse can not be broken, only be passed on to someone else. The Iron Shadows are one of my favorite creatures in general and from Conan in particular, but this book only has half a page of information on them, which is almost entirely creature stats, barely mentioning any of their awesomeness. There isn’t even a picture. The Iron Shadows are a race of ancient humanoids who stand taller than any humans currently alive and are powerfully muscled with skin the color of blackened iron. They tortured and killed the son of a god, and in turn they got cursed to become statues, only to become alive again when the light of the moon shines on their bodies. The rest of the time they appear to be statues made of solid iron. The ruins of their island home are avoided by any sailors of the region, but nobody really knows what exactly is haunting the island, since nobody who has seen the statues come to life survived to return to their ships. The iron shadows are cruel and evil and delight in slaughter, and everyone they find during a night in which the moon is shining is ripped to pieces by their bare hands. The rightfully called Monstrosity from Hell is one of the most ancient and powerful types of demons. It’s a gigantic mass of tentacles and tendrils of immense intellect and in addition to its ability to grab victims and swallow them in one go, they are also very powerful sorcerers and much to powerful to be summoned. They are also so alien to all life, that their touch afflicts any creatures with the curse that creates the foaming blasphemies. Starved Ones are basically zombies or ghouls who are constantly decaying at a relative rapid rate, losing 10% of their hit points every day. They regain their full strength and can regenerate decayed or lost body parts by eating the matching parts and organs of a dead creature. However, the newly regrowing organ will have the appearance of the organ that was consumed, not the form of the originally lost parts. There’s some potential here, but I think how scary they will actually be depends a lot on the GMs imagination for what kinds of corpses the starved ones are feeding. Tentacle Spawn are rather weak demons but tend to appear in large numbers. They are not actually individual creatures but rather just the ends of tentacles of much more massive and horrible beings from beyond this world, which often come grasping through portals much to small to allow the passage of the abominations entire body. I think they are making a great addition to encounters with evil sorcerers and the like and are more part of a dangerous environment than actual enemies themselves. Still, treating them as individual creatures would probably make a good job to make them appear as real threats. The Black Spawn of Jullah (see part 1) serve as conduits to the realms of otherworldly horrors and can let tentacle spawn burst from their bodies. A Wind Ghost is a type of air elemental that has no own physical shape, but can manifest in the form of dust and small debris picked up by the wind and forming into a large, roughly shaped face. They attack by picking up small objects in the wind and throwing them at their oponents. They can also cause very strong winds around them to throw any enemy around. The Yaggites are one of the really unique types of creatures found in the world of Conan. Yaggites are humanoid creatures of tall stature and with green skin, but their most striking trait are their heads that have a very close resamblance to elephants. Their homeworld of Yag was destroyed by their own kings and the survivors spread throughout the universe. Yaggites are highly magical creatures and powerful sorcerers. Originally the Yaggites also had wings, which allowed them to travel through space, but something about Earth caused their wings to disappear and any who came to visit this world ended up trapped, unable to return to the stars. Yothga is one of my favorite creatures from any Conan stories. It is a plant originally from the planet Yag, which was brought to Earth by Yaggites, probably by accident. Yothga grows to a massive size, its roots reaching impossibly deep into the ground, and it is said they are reaching down all the way into hell. While it is not a sentient creature, it preys on living creatures by poisoning them with its leafy tendrils. The poison is clouding the minds of any creatures and once the minds of its prey are completely gone, yothgas large red flowers drink the souls from its victims mouths. This process can take weeks or months, depending on the victims strength. If yothga can not feed on a regular basis, it becomes dormant and can no longer use it’s tendrils to grab new victims. It’s leaves are still poisonous though, and any creature that touches them for too long will fall unconscious and allow the plant to feed to regain its strength.